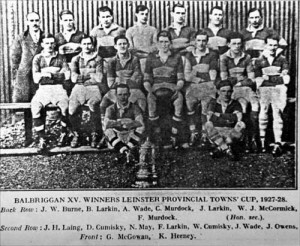 The Club was originally formed in Balbriggan in 1925. In its third year the Club won The Provincial Towns Cup, the premier competition in Leinster for Provincial clubs. A further Towns Cup appearance was in sight in one of the following years when the Club had won a semi final match against Carlow but an objection was made by our Skerries neighbours that we had played a person who lived in the Metropolitan area and we were out. The player concerned was Tommy Larkin, a member of the well known Balbriggan family and Uncle of former secretary Tom Poynton, whose job meant that he stayed in the city every now and again. The Club in that era played at the Rope Walk which is now the Community College. Unfortunately Rugby in the town died out during the mid to late Thirties. In the mid Fifties Delvin Rugby Club was formed and for many years had a Balbriggan base. Delvin has since relocated to Drogheda where it merged with Drogheda RFC to form Boyne RFC. Adult Rugby commenced in 1975, after losing the first of the Culleton finals, and the core of those early youths teams were the basis of the adult teams until very recently. Felim White was the first Captain of the Club and the players in those first few seasons were a mix from the youths, those who had played Rugby elsewhere or those new to the game. The first game played was against Barnhall who just this season have been promoted to the All Ireland League. The Club can look back at a reasonable level of success over that period. The Area Leagues have been won on numerous occasions and we have won our Provincial Cup, the Anderson Cup in 1980, 1993 and 2000. The Club now play in Div 2B of the Leinster League. This gives the Club the opportunity to determine their own destiny as the whole league structure will now be integrated up to the top level. The Women’s team play in Div 2 of the Leinster League. Back in the 1990’s the club fielded a women’s team. At the time, women’s rugby was in it’s infancy in Ireland. The team struggled to find fixtures and soon disbanded. The development of women’s rugby in recent times, led to the re-forming of a women’s team at Balbriggan RFC in 2014. 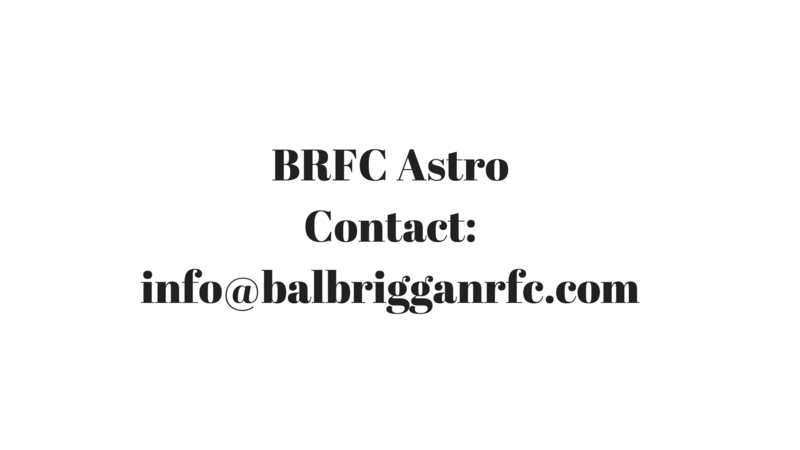 Some of the players who have passed through Balbriggan RFC have gone on to attain Provincial and Irish honours. Shane McLeer who played youth rugby (and some senior rugby) at Balbriggan RFC, went on to gain Leinster honours and an Irish trial while Declan Quinn, son of club stalwart Mick Quinn, went on to gain Irish youths honours for two seasons competing on a Youth’s team that won all their games. Currently, former Balbriggan player Jamie Hagan is playing professional rugby in France, having previously played rugby for Leinster, Connacht, London Irish and Melbourne Rebels. Dean Moore has also played professionally in France, playing for Auch. 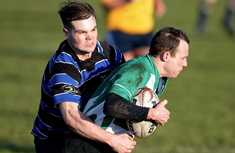 The development of youth and mini rugby is at the heart of Balbriggan RFC. John O’Byrne who played on the initial youth teams initially took on the co-ordination of this role. O’Byrne stated that the first step was to put together a committee and come up with a plan. The initial thrust was to start the youths at the U8-12 group and depending on the response look to the older age groups. One of the first steps was to appoint a Youth’s Co-ordinator, New Zealander Greg Thurlow was the first in this role followed by David O’Sullivan the then Senior team Coach. The mini and youth structure has changed since then. The current mini co-ordinator is Eamon Darcy (U6-U12). The club youth co-ordinator is Kevin Colman(U13 and up). Club CRO (Community Rugby Officer) is Ariel Roubles. In 2002 another Club stalwart Mal Malone took on the role of Youth’s Director. He brought in Dale McAuley as Youth’s co-ordinator. Dale had fulfilled a similar role in his native Australia. Under Dale’s guidance management structures were put in place for each of the Youth’s teams, fielding Youth’s teams from U8 – U18, a total of 6 teams. A number of players went on to get area honours in only their second year playing. The club has continued to grow and now has a thriving Mini’s section, along with a growing Youth section. At present we are fielding two mens teams. 2014 saw the return of Women’s rugby to Balbriggan RFC for the first time in 20 years. At present training takes place at our grounds at Inch, Balrothery at 7.30pm on Tuesday and Thursday nights.